The carpet runner over the oak flooring in our central hallway has definitely been showing some signs of age; even carpet gets wrinkles! 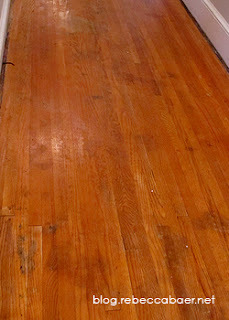 Refinishing the floors (the same flooring flows from the hallway into most of the adjoining rooms) is definitely not in the budget nor practical from a time management standpoint so it is time to get creative. 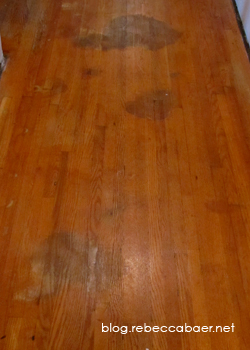 We began by removing the carpet to reveal the current condition of the floor. There are several dark stains, which prevent us from just leaving it its natural state. I'm partial to the natural beauty of the hardwood and was hesitant to cover it whether with carpet, floorcloth or a coat of paint although paint seemed to be the cheapest and most expedient solution. Instead of painting the entire hallway I decided to create a freehand, open design that allowed most of the golden oak to show while drawing attention away from the stains, which are irregularly spaced and vary in size. Free-handing the design also allows for creative freedom to transition through doorways and into the adjoining rooms. 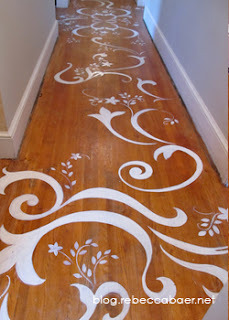 If you want to try a project like this and are not comfortable free-handing a design you could use stencils to create the patterning on the floor. The floor must be clean and free of debris. If stains are prominent you may want to try and lighten them. Then match the existing color as closely as possible with stain. The contrast of the painted design is intended to mask imperfections so only very noticeable marks need to be addressed. The original marks on my floor were quite dark but I was able to lighten and re-stain them so that they blended very nicely. 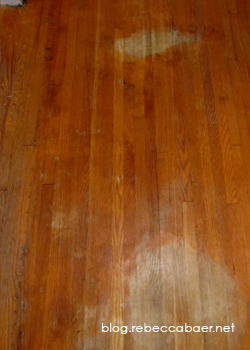 If you repair stains on your floor you will need to sand between lightening and re-staining as the process raises the wood grain. Lightly sand the surface with fine (150 grit) sand paper to scuff and provide tooth. Then wipe with a tack cloth or swiffer to remove all dust. Do not use a water as it will raise the grain of exposed wood. It doesn't hurt to give the floor a wipe with mineral spirits as well to make sure no residual wax or other surface impurities remain. Next, layout the design. 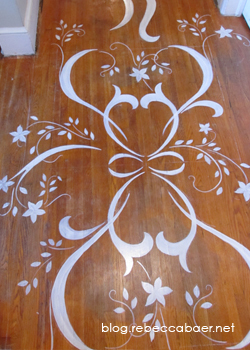 I have used a chalk pencil to draw my design right on the floor. This way I could see it in place and easily wipe away marks to revise areas as desired. This also allows me to plan from the center but begin painting at one end and still have the design work out. 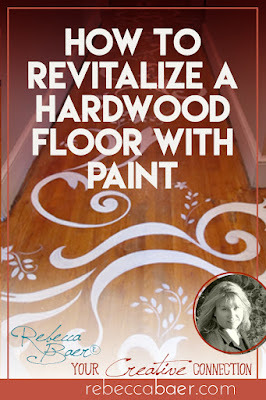 Floor & porch paint should be used as it is much more durable than wall paint. I have chosen white because the finish I am using as a topcoat has a slight amber hue, which will add warmth as if I had used a cream color paint. I am using a clear topcoat because of the natural wood areas. If you paint the floor a solid color then detail with a contrasting color no topcoat is required over the floor & porch paint. Plan your direction! You don't want to paint yourself into a corner then have to tiptoe through the design. You may also need to strategically paint the floor in sections or create bridges using planks if you must have access through the area. With the high contrast of the white against the oak the blemished areas recede into the background causing the eye to focus on the decorative elements.